​At Marathon Park, nestled among the tall trees, on Thursdays at 7 pm, from June through early August, the Wausau Concert Band regularly performs. The Concert Band is supported by grants from the City of Wausau, the Community Foundation of North Central WI, the BA and Esther Greenheck Foundation, the Judd S. Alexander Foundation, and the Raymond and Marie Goldbach Foundation. ​According to Marathon County Historical Society Archivist Ben Clark, as far back as the 1880s, a main bandstand was located on the grounds of the Courthouse Square, but it was torn down in 1922. There was an attempt to raise funds to replace it (including a baseball game between city and county employees), but they were burdened by petitions to add bathroom facilities and a "comfort station", so the issue was tabled until more funds could be obtained. 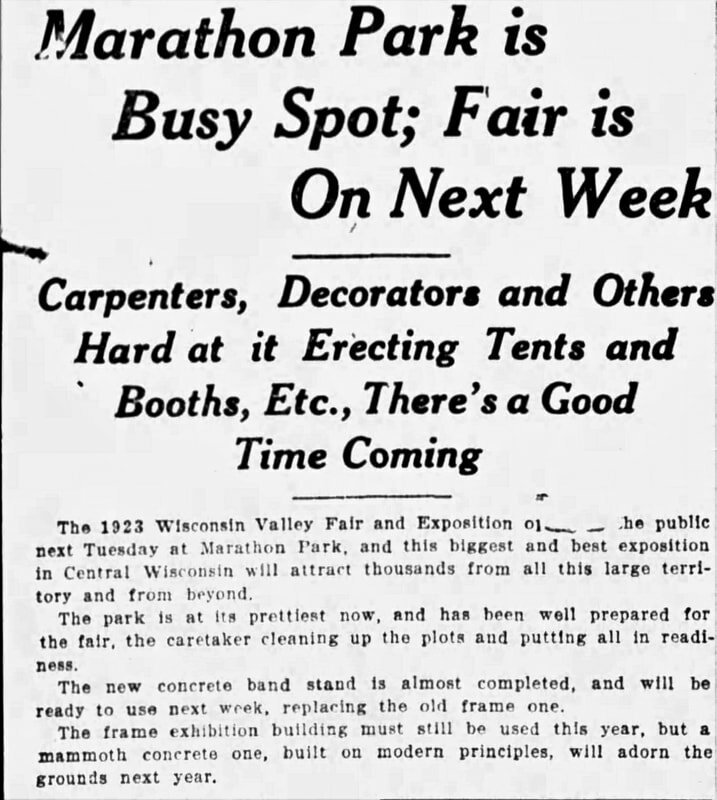 In 1921, Marathon County was given land for Marathon Park for the fairgrounds. The focus was then shifted to building a bandstand at the new park along with many other fairground structures. It would solve the problem of parking which often blocked traffic at the Courthouse Square. 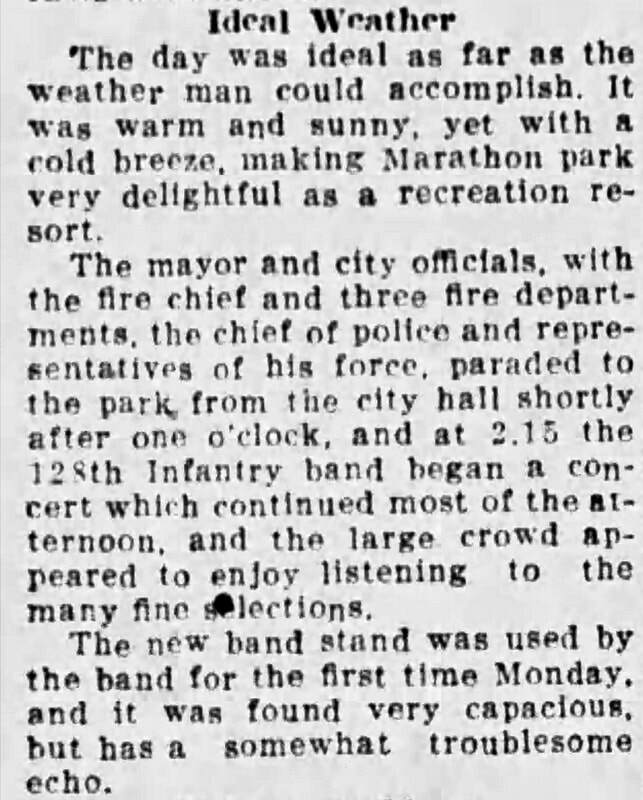 According to various Wausau Daily Herald's issues from 1923, the first concert at the bandstand was Labor Day, September 4, 1923, with the 128th Infantry Band, part of the 32nd WI National Guard, playing. It was reported that, apparently, while they enjoyed the extra leg room, it was noted that it had "troublesome echos". Other, members of more current bands who have played there, concur. Today, it remains a popular bandstand in the community. Cars have been known to honk their horns from the nearby parking lot, in appreciation of its music.